FORT MYERS BEACH, Fla. — Newly released surveillance video shows a woman in a Florida bar smiling and talking with a fellow patron whom police say she later killed so she could steal her identity. The video released by the Lee County Sheriff’s Office shows 56-year-old Lois Riess of Bloomberg Prairie, Minnesota, talking to 59-year-old Pamela Hutchinson April 5 at the Smokin’ Oyster Brewery in Fort Myers Beach. “It’s just evil that flowed through. Because how can you go around killing people for no other good reason other than to keep yourself out of prison,” Danielle Jeffreys, Hutchinson’s cousin, told CBS News correspondent Mark Strassmann. 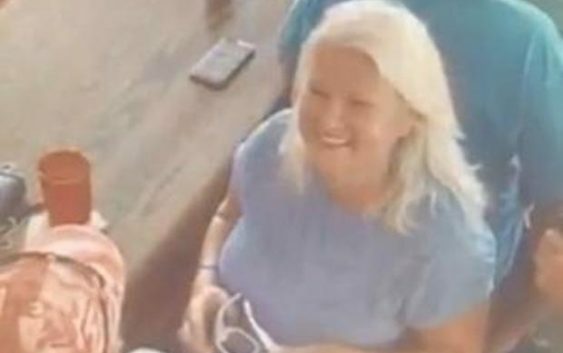 The video released by the Lee County Sheriff’s Office shows 56-year-old Lois Riess of Bloomberg Prairie, Minnesota, talking to 59-year-old Pamela Hutchinson April 5 at the Smokin’ Oyster Brewery in Fort Myers Beach. Police say Riess is also wanted for the March slaying of husband David Riess in Minnesota. Authorities say she may have targeted Hutchinson because the two women looked alike. Riess is still at large. Authorities say she stole Hutchinson’s car, which has been seen in Louisiana and Texas. Investigators say Riess has since driven 1,300 miles along the Gulf Coast until her last known sighting in Corpus Christi, Texas. “As her resources go away she may become more desperate and God forbid may strike again,” said Marceno. Police believe Riess killed both victims with the same gun, and may still have it.